This PDF 1.5 document has been generated by Microsoft® Word 2013, and has been sent on pdf-archive.com on 04/07/2014 at 08:12, from IP address 117.211.x.x. The current document download page has been viewed 378 times. File size: 412 KB (7 pages). been compared with those of experimental data and of a numerical model online available. Modelling, Output and Transfer Characteristics. power consumption and increased performance. new opportunities arise from harnessing the physical and chemical properties at the nanoscale. contending device to replace conventional silicon transistors . cylinder shapes, some time with closing hemispherical meshes on the tips. directly implemented in CAD tools, such as SPICE or VHDL-AMS. characteristics through a best-fitting procedure,. data obtained from simulator online available . charge will tunnel through it: this will be the ultimate size and performance of silicon-based devices. 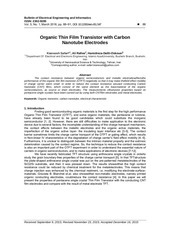 conducting channel with carbon nanomaterials such as one-dimensional (1D) CNT or twodimensional (2D) graphene layers. chemistry and physics, new sophisticated mathematical tool to face probability amplitude waves. gap inversely proportional to their radius . terms of “on-off” ratio currents and sub-threshold swing. Figure 1. 3D representation of a C-CNTFET. being Vds the drain-source voltage and Vgs the gate-source voltage. the knee region, modifying here the behaviour of hyperbolic tangent function. them without affecting the I-V model accuracy. 11 parameters in two batches. does not depend on the bias conditions in a first approximation. measurements, i.e. in the linear and saturation regions. impose that tanh( * Vdsat) → 1.
a0 = 6/ Vdsat a1 = 0 a2 = 0 a3 = 0.
necessary to compare the modelled values. characterizing the linear region, i.e. ao, a1, a2, a3, M, are obtained. model calculation are reasonably small. characteristics are reported in  and in . according to our procedure and the experimental ones  (denoted by +). terms of Ids versus Vds. The calculation error has been very low, |E| = 1.71 mA, with relative percentage of 4.4%. Moreover the CPU calculation time was very short, 0.03 s, by using a 2.4 GHz compatible PC. experimental ones  (denoted by +, *, triangles, etc., for any value of VDS). triangles, etc., for any value of VDS). and the numerical IDS – VGS characteristics (denoted by +) . extracted by a quick and accurate procedure. physical considerations, making univocal, fast and easy the extraction of the best fitting parameter set. order of 1% or lower, with a CPU calculation time much more low. it, both in Verilog-A and in SPICE simulators, to design typical analogue circuits and logic blocks. editors Rotkin S.V., Subramone S. Berlin Heidelberg; Springer-Verlag; ISBN: 978-3-540-23110-3. Perri A.G. (2011) “Dispositivi Elettronici Avanzati”, Editor Progedit, Bari, Italy, ISBN: 978-88-6104081-9. Transactions, vol. 23, issue 1, ISSN: 1938-5862, pp. 429–437. 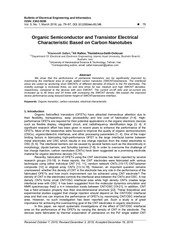 Electronic and Optoelectronic Engineering”, Ed. Research Signpost, Kerata, India, 2011, ISBN 97881-308-0450-7, pp. 113 - 142. Sciences, vol.11, issue 3, pp.377-385. Compact CNTFET Model Implementation”, Current Nanoscience, Vol.8, issue 4, pp.556-565..
and Test of Integrated Systems in Nanoscale Technology, pp. 40-45. Engineering in 2008 from Polytechnic University of Bari, where he received his Ph.D.
Interuniversitario per le Telecomunicazioni. Dr. Marani has published over 100 scientific papers. international journals. Prof. Perri is the holder of two italian patents and the Editor of two international books. This file has been shared by a user of PDF Archive. Document ID: 00172467.